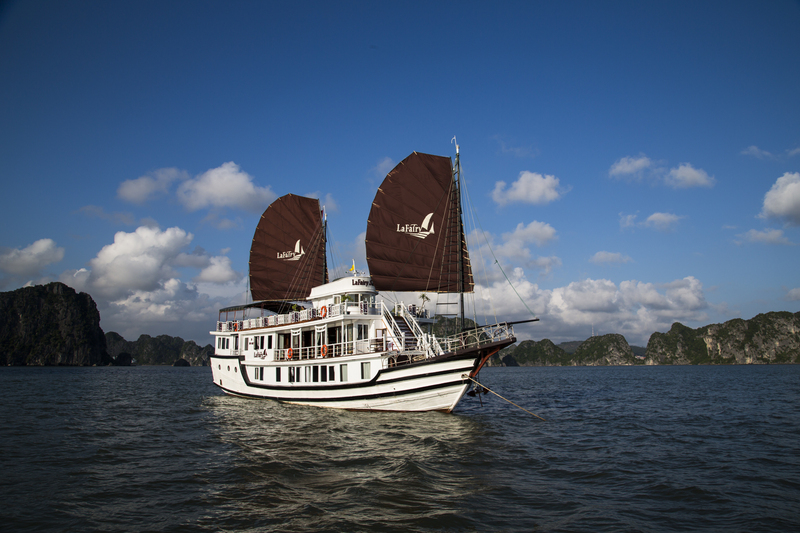 LaFairy Sails would like you to join us for a breathtaking voyage in the UNESCO World Heritage Site, Halong Bay. 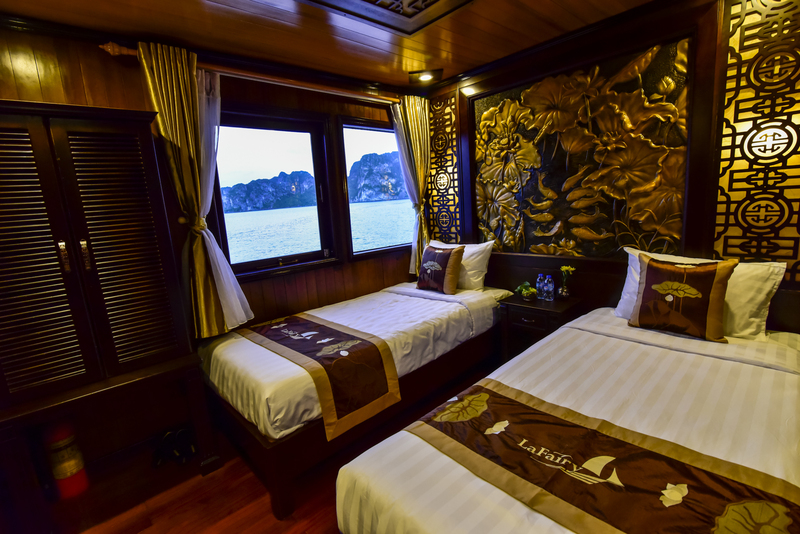 A LaFairy cruise will take you through Halong Bay’s natural wonders, and beyond into less traveled waters, all while you enjoy luxurious accommodations on one of our newly-built, traditionally-styled vessels. Our company name is inspired by one of the thousands of caves in Ha Long Bay – a magical cave with a hidden lake where they say fairies come to bathe. Our goal is to share that magical feeling with you. 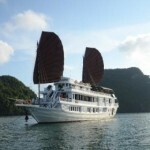 Visiting Halong Bay with LaFairy Sails will surely be one of the most memorable parts of your visit to Viet Nam. Enjoy Halong Bay with an unforgettable LaFairy cruise: We sail your vacation! Features: New Deluxe Cruise! LaFairy cruises have just been launched in 2015 with comfortable rooms. 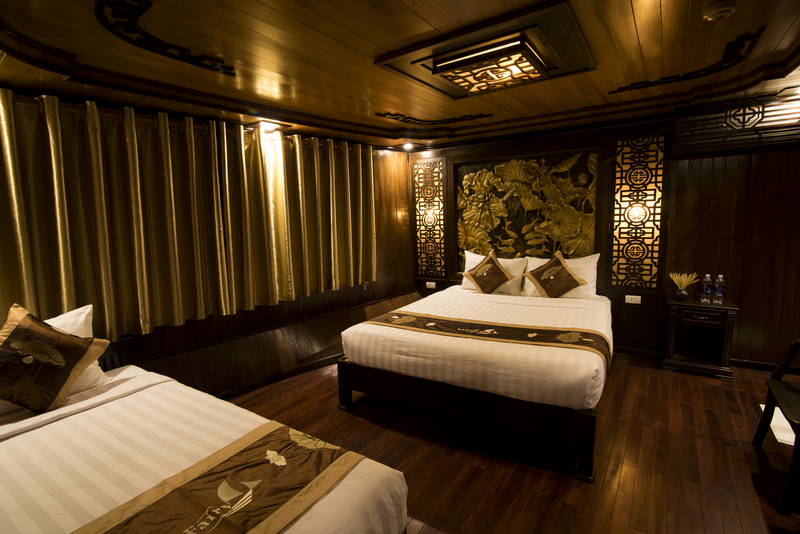 Specials: Premium Room with Private Balcony! LaFairy Cruise has Premium rooms with private balcony! 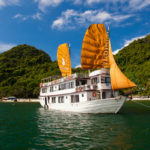 A two day, one night cruise on LaFairy Sails is the best choice for you to see both the magnificent Halong Bay and the more primitive Bai Tu Long Bay with our “off the beaten track” itinerary for a limited time schedule. You will not only explore less-visited sites in Bái Tử Long Bay, but will also take part in a many other interesting activities such as: swimming, kayaking, dining in a cave, visiting a fishing village and being inspired by some of the thousands of fairy stories relating to the legendary bay. .07:45 – 08:15 : Pick-up at your hotel near by the Old Quarter in Hanoi by shuttle bus. 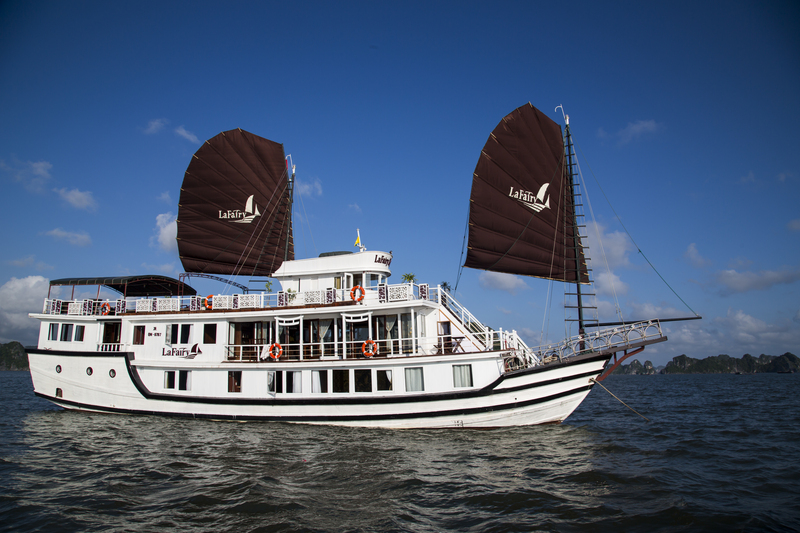 12:00 – 12:30 : Embark the LaFairy Sails at Hon Gai International harbor. Enjoy a welcome drink and cruise briefing. 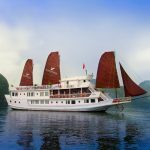 13:00 – 15:30 : A sumptuous lunch is served while we cruise into the untouched Bai Tu Long Bay with its thousands of extraordinarily shaped limestone islands, considered by the Vietnamese to be heaven on the earth. 15:30 – 17:00 : Explore the Lờm Bò area and be charmed by this outstanding masterpiece of Mother Nature. Visit Mê Cung Cave – one of the most beautiful caves in Halong Bay and climb up to see the panoramic view of the bay from above. Enjoy swimming in the peaceful, crystal water of the Bay (optional). 17:00 – 19:00 : Return to the LaFairy Sails for a Sunset party to admire the best moments of the day when the sun starts to set. 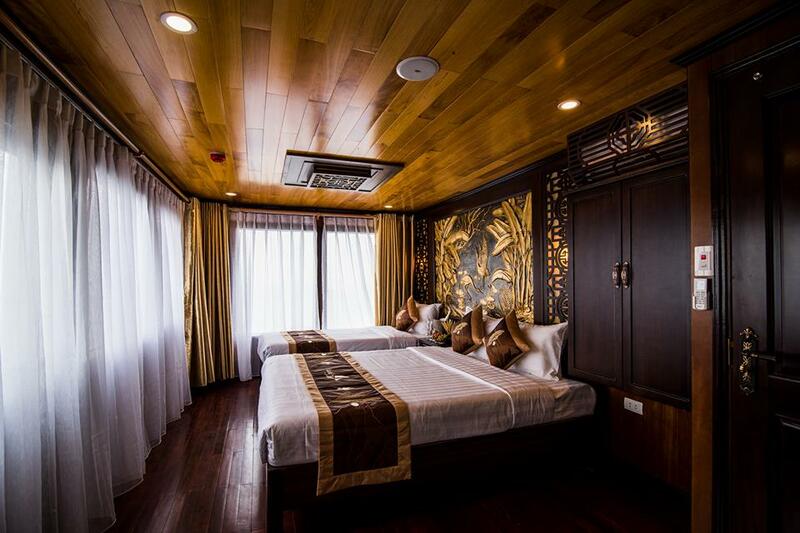 Or enjoy a private massage in your comfortable cabin. 08:00 – 09:30 : Start cruising to Vung Viêng fishing village. Options 1: Visit the village by bamboo boat, get closer to the characteristic landforms and learn more about the local way of life. Option 2: Enjoy swimming on a white sand beach or go kayaking through the hidden beauty of the Bay. 09:30 – 10:00 : Pack your luggage and check out of the cabin while cruising towards the harbor. 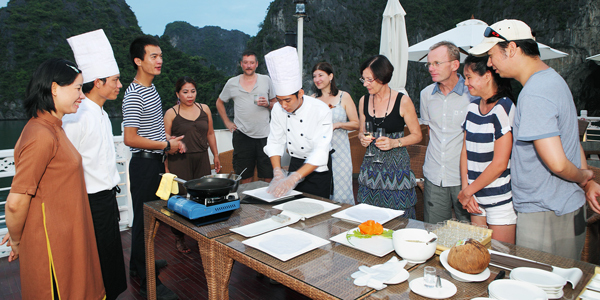 10:00 – 11:30 : Join in a cooking demonstration before enjoying an exceptional Buffet lunch. 12:00 – 12:30 : Disembark the LaFairy Sails & Farewell. 16:00 – 16:30 : Arrive in Hanoi. Trip ends. 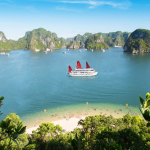 A three day, two night cruise on LaFairy Sails is the perfect choice for you to see both the magnificent World Heritage site – Halong Bay, and the more primitive, off-the-beaten-track Bai Tu Long Bay, and to also get a close look at the area’s unique and spectacular limestone formations and caves. 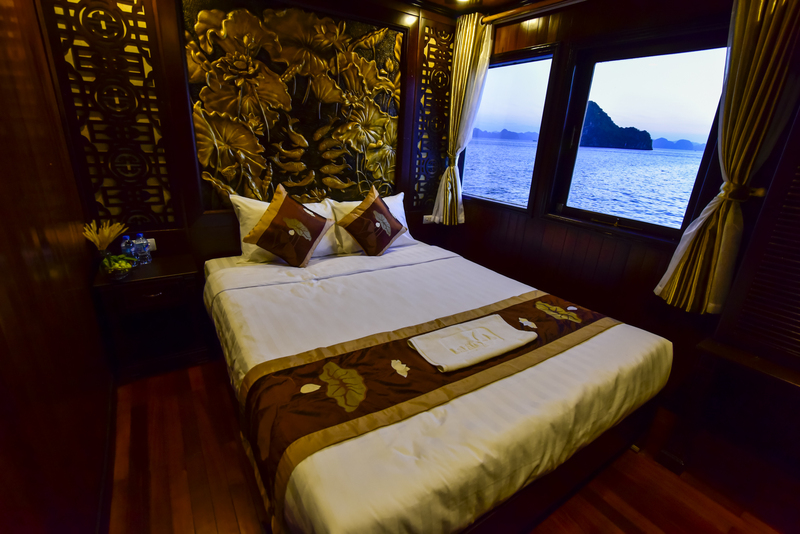 You will visit white sandy beaches, hidden caves, a typical fishing village, go kayaking, and just relax, all while enjoying the luxury of your comfortable, fully-equipped cruising boat with its well-trained staff and delicious meals. 15:30 – 17:00 : Explore L ờm Bò area and be charmed by this outstanding masterpiece of Mother Nature. Visit Mê Cung Cave – one of the most beautiful caves in Halong Bay and climb up to see the panoramic view of the bay from above. Enjoy swimming in the beautiful crystal water of the Bay (optional). 17:00 – 19:00 : Return to the LaFairy Sails for a Sunset party and admire the best moments of the day when the sun starts to set. 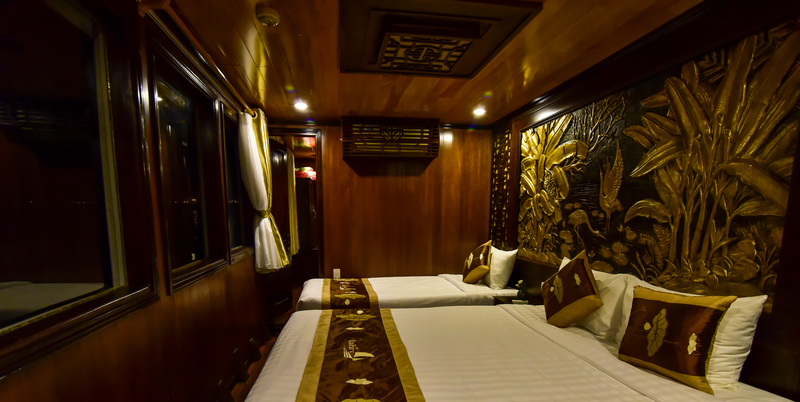 Or enjoy a private massage in your comfortable cabin. 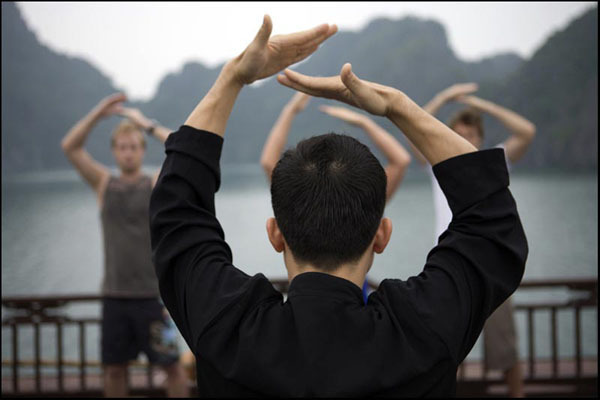 06.30 – 07.00 : Start your new day in Halong Bay with a Tai Chi session or a sunrise photo opportunity. 07.00 – 08.00 : Enjoy breakfast in the peaceful bay while listening to the bird songs all around you. 10:00 – 12:00 : Head back down to the beautiful white-sand beach at the foot of Hon Co Island. Go kayaking though the tranquil blue water of the Bay and enjoy swimming or sunbathing at this lovely, off-the-beaten-track beach. 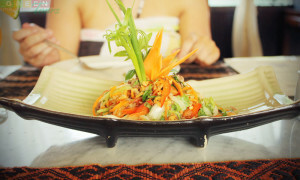 12:30 – 14:00 : Go back to the boat for a delicious lunch. 14:00 – 16:30 : Kayak through the hidden lagoons and explore the biological diversity of the Bay. 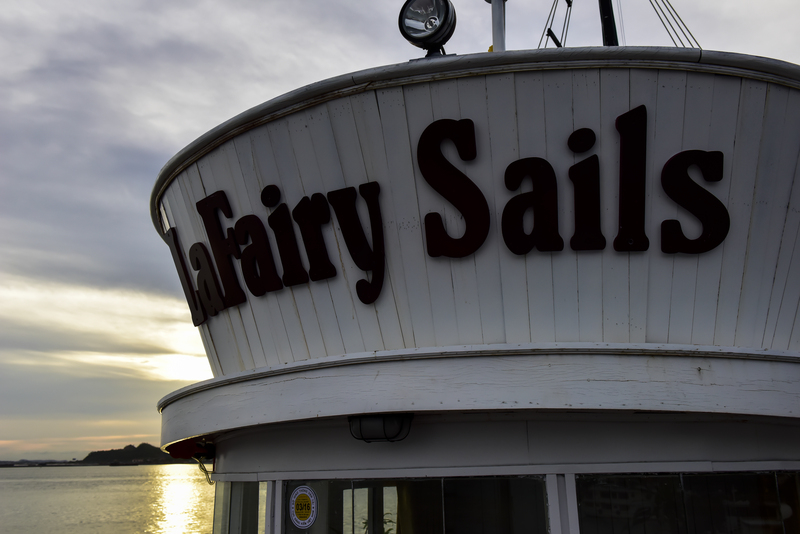 16:30 – 19:00 : Return to the LaFairy Sails for refreshment and relaxation on the boat’s top deck. Relish the most beautiful time of the day at the Sunset party and watch the sun go down reflecting its beauty in the sky on the water’s surface. 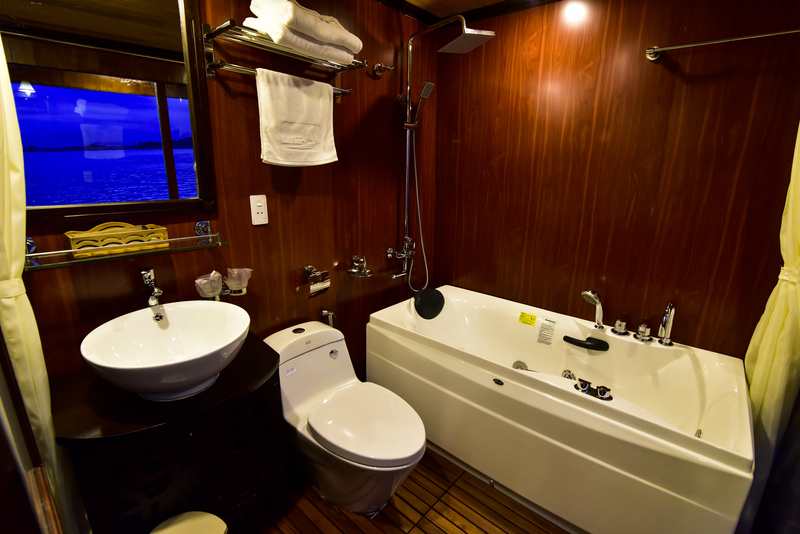 Or enjoy a massage in the privacy of your comfortable cabin. 19:00 : Savor an incredible dinner of traditional Vietnamese food and view a fascinating vegetable carving performance, while being introduced to the philosophies that lie behind each type of Vietnamese cuisine. 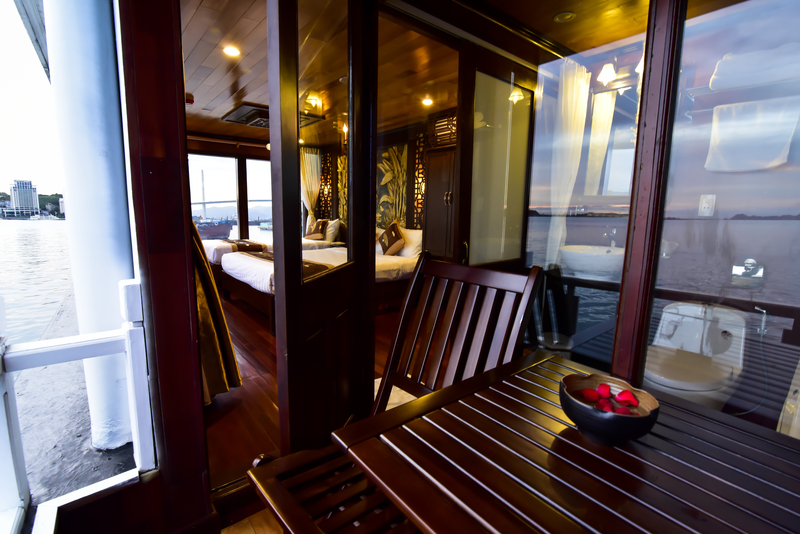 Socialize on the boat’s top deck, enjoy squid fishing, or simply relax in the tranquil bay. Overnight on board. Options 1:Visit the village by bamboo boat, get closer to the characteristic landforms and learn more about the local way of life. 12:00 – 12:30 : Disembark the LaFairy Sails& Farewell. Cruises promotion is subject to availability. This voucher is not valid on Public Holidays and cannot be used in conjunction with other promotions, offers or discounts. Full payment upon final confirmation or 15 days before cruise date is required.